Virtualization has become the go-to technology to help organizations of all sizes successfully consolidate IT resources. Businesses can yield dramatic cost savings through consolidation while making their IT infrastructure less complex, simpler to manage and far more agile. 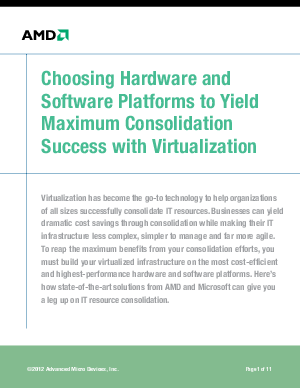 To reap the maximum benefits from your consolidation efforts, you must build your virtualized infrastructure on the most cost-efficient and highest-performance hardware and software platforms. Here's how state-of-the-art solutions from AMD and Microsoft can give you a leg up on IT resource consolidation.